There is no debate about the natural, normal, unique, and lifelong process of the grief of the death of a loved one. The loss is an intensely individualized experience. Yet, given an understanding of human growth and development, some general predictions about the concept of death and the grief reaction can be made based upon common patterns of cognitive and emotional maturity at various stages of childhood. These general considerations can enhance the quality and nature of supports that are provided to the grieving child or youth. Such improvements are sorely needed in the American culture, where children are typically protected from discussions of death and overlooked in the mourning and grieving process. This is Megan's story ..... It was Saturday, November 6, 1993. As a family, we had played a game of SPLAT at the card table. My two brothers, David and Patrick, then nine and five years old respectively, were reluctant to go to bed. David went into my parents' room to "borrow their toothpaste" as a stalling tactic. At 7:00 A.M., Dad had to be at the hospital to start his workday. He curtly told David to get to bed. David and I talked for a little while and played more card games. This was unusual. Most of the time, we were at each other's throats. I went to my room to work on a Social Studies project for a while. Then, I went back to David's room. He offered me the handmade construction paper turtle he had just designed. It was held together with surgical tape. We hugged, told each other good night, and said "I love you." David died in his sleep that night. I remember that people responded to Patrick and me in ways that attempted to protect us from hurting. I also remember the range of emotions that seemed to overwhelm me. What if his death was a punishment for all the times that we fought over the good spot by the television, the front seat in the car, the selection of the Christmas tree, and who was responsible for starting the fights? I felt that it was my responsibility to take care of the family, as the oldest child. Yet, it was extremely difficult to wake up each of the next mornings, knowing that David wasn't going to return. When I got to school, I felt different from the rest of my eighth grade peers. There were some outlets at school to turn to (e.g., friends, counselors), but I was not able to express my feelings of loss. Megan's story is true. Megan's story is painful. Megan's story describes many of the conflicts that an adolescent experiences when confronted with a sudden, unexpected death. Adults often shield the younger family members by limiting discussions about death. By avoiding a shared social response to the loss, adolescents like Megan may be denied the right to mourn. This can isolate the teen and delay the recovery process. It ultimately does not protect them from hurting. Megan describes a range of emotions in response to David's death. Adolescence is a developmental period that is filled with change, particularly as teenagers struggle with issues of independence versus dependence. It is normal to expect conflict in determining how to deal with grief (i.e., as a child or as an adult). Anger, depression, withdrawal, acting out, noncompliance, frustration, and confusion are typical grief responses (Metzgar, 2002). Frequently, the misinterpretation of David's death as a punishment for Megan's sibling interactions with him is reported (Rando, 1984; Wolfelt, 1991). Intense relationships are formed between siblings. These relationships encompass competition, rivalry, love, anger, arguing, and friendship. Adolescents may focus upon the negative interactions and feel a sense of guilt and responsibility for the death in some way. Megan also relays a feeling of responsibility for her family. This might be the result of social expectations that are placed on teenagers to be grown-ups and demonstrate strength for the other younger sibling. Or, the adolescent may be suppressing her own feeling of helplessness in the face of a traumatic experience and, instead, compulsively care for others. Either reason will still result in role confusion for the teenager who is now trying to function in an adult role. Megan speaks of difficulty in waking up and facing the day without David. The suddenness of her brother's death left Megan in a state of shock and disbelief. A sense of unreality and numbness would naturally accompany an unanticipated death of a loved one. Self-perception, too, can change as a result of loss of a close family member. Megan describes herself as feeling different from other eighth graders. An adolescent's normal egocentrism can cause her to focus upon the effect of the death upon her life (Rando, 1984). Parents and siblings help to shape self-identities. The loss of David placed Megan's life under reconstruction to examine her new self-image. Finally, Megan shares the inability to benefit from outlets at school that could assist in the grieving process. Were efforts to help hampered by Megan herself or the services being offered? Adolescents can send mixed messages regarding their needs (Cunningham, 2002). Some teens may hold back their feelings, giving the impression of being unaffected. For other teens, guilt interferes with the ability to express themselves. Vulnerability may also impede communication, as the teen turns inward to deal with the pain. On the other hand, the outlets have to be analyzed for adequacy. Were the school resources safe and nurturing'? Was there a strong message that there is no shame in grief? Were the support services targeted to Megan's developmental level and needs? Adolescents function in the Piagetian stage of formal operations (Gorman, 1972). Theoretically, teens should be capable of abstract and formal thinking, problem-solving, and deductive reasoning. At this age, personalities are being integrated. Adolescents can comprehend concepts of death, which serve as a vehicle for more in-depth spiritual and conceptual thought (Walker & Roberts, 2002). While adolescent perceptions of death are becoming more mature, mourning during the period is complicated by concurrent developmental tasks. Adolescents are facing intense psychological, physiological, and intellectual pressures (Wolfelt, 1991). Psychologically, teens are in the process of striving for independence, while still depending upon the family for emotional and financial support. Physiologically, adolescents are experiencing many physical changes, often feeling awkward during the process. Intellectually, many teens are being encouraged to succeed academically to secure a solid future. The death of a sibling, then, can be a shattering event during an already challenging period of life. Supportive interventions for adolescents could include open discussions with trusted adults and peers, explorations of questions of life and death, permission to mourn, appropriate assignment of role responsibilities for the age, models of healthy coping behaviors, and toleration of some acting out behavior. Research is largely in favor of support groups that are based upon the philosophy that bereavement is a psychologically healthy and normal state (Grollman, 1991; Grollman, 1995). Efforts here must focus upon valuable insights and innovative coping mechanisms for the teen. There are no fixed courses of action to take for any age group due to the individual grief responses of each child (Bissler, 1997). However, developmental theory such as Piaget's stages of cognitive development can assist in helping adults to anticipate how a child may approach and understand such a challenge. Responses to loss at every stage of development raise concerns and unique support needs. At approximately 7 to 11 years of age, children are functioning in the concrete logical operational period, according to Piaget. As the child moves through this stage, the reasoning processes become more logical. Yet, the child will still struggle with complex, abstract situations. In addition, the child's egocentrism will cause continued need to validate his or her own thoughts (Tribe, 1982). The impact of this thinking upon how a child of this age views death is an awareness of the finality of death and the fear of how the death personally affects her own life (Mihalko, 2002). At this younger age, Megan's grief response may have been similar to the common reactions experienced by 7 to 11 years olds. For instance, children facing loss may retreat socially and academically. The child may elect to withdraw from friends at school as well as loose interest in scholastic activities. The child who is internalizing the grief may maintain a relationship with the deceased in a fantasized way. Quiet responses can often go unrecognized. On the other hand, a child of this age level may externalize the reactions to death by acting out. The inability to handle grief feelings may result in angry outbursts, irritability, sleeping and eating disorders, and persistent questioning about the details of the death. Other frequent expressions of grief at this age may include fear of personal fallibility, hypochondria, and shock. The guilt response relayed by Megan at an older age is also prevalent at this age level. Intense guilt may be experienced in this phase. Children, based on their natural egocentricity, tend to believe that they could have changed the course of events (Fry, 1995). Feelings of powerlessness that result from an inability to have prevented the loss or change the current situation fuel these emotions. A child may draw the conclusion, therefore, that the way she treated her brother somehow accounted for the sudden loss. Interpreting the grief response of 7 to 11 year olds is puzzling. Children may disguise their pain with a façade of independence and coping or they may erupt with emotional signs of distress. Supportive responses must be adapted to the need. Selective use of these suggestions is warranted. First, on-going discussions can address the child's concerns, fears, emotions, and questions. In addition, discussions might focus on the awareness of and reasons for the acting out behaviors or the guilt responses. Second, passive outlets of expression could be more appropriate for the youngster. Drawing, writing, or symbolic play can provide the means by which the child conveys feelings. Some private time may be productive for some children to reflect upon the loved one. Third, modeling healthy coping behavior is essential. Participation in the funeral and other rituals of mourning should be offered, but not forced. Recollections of the deceased through an exploration of mementos can also be beneficial. And fourth, time needs to be spent with family to rebuild a sense of security and stability. It is imperative to return to routines and favored activities as soon as possible. In Megan's family, Patrick, age five, was at the preoperational developmental stage at the time of David's death. Due to the varied cognitive and emotional levels of Megan and Patrick, differential reactions to the death would have been evidenced. 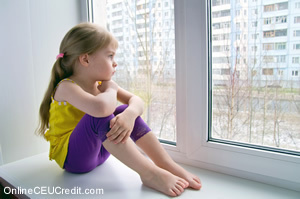 Children ranging from age 2 to 7 years have a distinctly different way of approaching grief. According to Piaget, children make progress in their language acquisition during this time (Penrose, 1979). They participate in play and imitation to learn, explore, and alter existing mental schemas. Fredlund (1984) reported that children between the ages of 4 and 5 years of age, in particular, are very vocal about death. They engage in role-plays in which death is acted out. Children from 2 to 7 years of age are also egocentric and feel that the world thinks and feels the same way they do. A child considers cause and effect as a given. At this age, children strongly identify with a vital model in their life. Consequently, the understanding about the permanence of death will not be understood for a child between 2 and 7 years of age because concrete operational understanding is not developed until around eight years of age. In addition, at this early age, a child will not understand biological causes of death because their abstract reasoning has not yet developed (Walker, 2002). Yet, a child at this age knows about his or her own body and tries to feel what it is like to die. Children can become upset by these thoughts, if they assume that the death was painful. Children are vulnerable during this stage because of their limited cognitive understanding. A child might deny that the death occurred (Rando, 1984). Children who are 2 to 7 years old will think that death is reversible (Metzgar, 2002). A common explanation for death by young children is that the person went to sleep, but will be back. Though permanency is developmentally difficult for this age child to grasp, adults must reinforce the reality that the person will not return. Children will also take the blame for the individual's death because of previous unpleasant interactions. Children might feel that the person left because of something that they did wrong and that they are being punished. Youngsters also believe that their magical thinking may have caused the death to happen and that this thinking can bring the person back to life (Fry, 1995). The children will show how they are dealing with grief through their actions. Two to 7 year olds will ask many questions about why and how this happened. Their goal, through repeated questioning, is to make sure the answers are consistent and use them to make sense of the reason for death (Metzgar, 2002). Socially, this age group will deal with death by isolation or acting out (hostile play) because they have trouble verbalizing their feelings. Playing becomes an escape from reality and the confusion of the situation. Children might be seen playing only minutes after they find out about the death of a loved one, which is a normal way of protecting themselves (Wolfelt, 1991). At this age, children sense when there is sadness in the home. Inner feelings will be seen only for short periods of time before they are hidden again. Some children might respond by regressed to immature behaviors, such as, bed wetting or thumb-sucking (Fry, 1995). This behavior may be a manifestation of their need for security (Wolfelt, 1991). Affection and physical contact, even from strangers, may become desirable. Interventions for coping with grief for 2 to 7 year olds include strategies that take into account their developmental level and use their cognitive ability to address feelings and emotions. Since children at this age are physically active, using play is a technique that brings out their feelings through a comfortable and age appropriate activity (Wolfelt, 2001). Children can also draw a picture of something they used to do with the person who died, make up stories that share how they felt about the person, do something that the person who died liked to do, or make a memory book about the individual (Wolfelt, 2001). It is through the remembrance of losses that adults can validate that the loss has been an integral part of the child's life. They can also be read stories that incorporate death and loss. Bibliotherapies may allow the child to identify with the main character, thereby experiencing some cathartic feelings in the process (McCarty & Chalmers, 1997; Sridhar & Vaughn, 2000). It is critical to give the child an opportunity to talk, if they feel comfortable doing so. Honesty holds a substantial place in the grief counseling process to ensure the child's security. Talking to the child about spiritual and religious considerations can play a powerful role in comforting a child and giving hope as well. Teaching a child about the circle of life can make the process more concrete. A child can be shown how a dying flower blooms, has a beginning, and an end. Encourage the child to express how they feel and make it acceptable for the child to cry, show anger, or frustration. Sometimes a child might not be able to verbalize emotions; therefore, support in helping to identify and explain their feelings is crucial. Children need the security of a normal schedule even under these circumstances. Caregivers need to be extra tolerant and supportive during grief. The child should be reassured about his or her beliefs and, when ideas are not plausible, they should be mildly modified by the adult counselor. These techniques can uphold a child as s/he works through the grief. For children who are entering the preoperational stage (2 to 4 years of age), there are additional ways to intervene. Children during these early years need short interactions because of their limited concentration time. Using repetition and consistency in language is appropriate for young children (Metzgar, 2002). In addition, using physical comforting and touch produces a calming effect. If a caring adult does not maintain constant support and attention, the reaction of a young child could turn to detachment from everyone (Rando, 1984). Just like younger preoperational stage children, infants have a strong sense of the uneasiness in a grieving household. There is no understanding of death, but due to the anxiety and tension felt by others, the child may show irritability (Rando, 1984). Reactions from the infant may include changes in eating, crying, and bowel/bladder movements. In order to provide stability, routines should continue as normally as possible. Most importantly, maintaining a warm and caring environment for the infant is essential to reduce the upset in the daily schedule. There is no debate about the natural, normal, unique, and lifelong process of grief. The experience of a loss due to the death of a loved one is an intensely individualized process. Yet, given an understanding of human growth and development, some general predictions about the concept of death and the grief reaction can be made based upon common patterns of cognitive and emotional maturity at various stages of childhood. These general considerations can enhance the quality and nature of supports that are provided to the grieving child or youth. These enhancements are sorely needed. McGlauflin (1998) condemns the dominant culture in America for protecting children from the difficult emotions associated with death. The consensus seems to be that talking about the experience will make the loss more difficult. Wolfelt (1991) refers to this as a grief avoiding culture. He points to a variety of reasons for children in the United Sates to grow up without exposure to grief. For example, geographically dispersed families, increased use of nursing homes, and prolonged life expectancy insulate children from confronting grief experiences earlier in their lives. And, he criticizes the tendency of adults to avoid sharing the grief experience with children. The children in America become the overlooked mourners of society. Rando (1984) agrees with this opinion, stating that the United Sates is a death denying culture. She attests to the widespread refusal to confront death and the extensive efforts taken to shield children from the pain of grieving. This protective approach is counterproductive. Ignoring the pain during such a crisis leaves the child in a vulnerable and isolated position. Grief is the process through which one goes when a loss is experienced. The experiences that are part of this process occur in differing sequences and intensity as well as time frames, depending upon the individual. Grief responses will also depend upon how significant the loss is perceived. In cases where the death is complicated by unusual circumstances, the grief process can be exacerbated. Many questions remain unaddressed or require further research. How does the grief process change when a child or youth is confronted with the death of a loved one that results from suicide, murder, accident, catastrophe, or terrorism? What additional supports are required when youngsters are faced not only with the death, but also with the social stigma of deaths related to suicide or AIDS, for example? How can children be assisted in the event of multiple losses? These kinds of situations introduce additional reactions of rage, revenge, abandonment, or trauma. While death and loss are a part of living, how do we compassionately and practically facilitate recovery for children and youth who face these intensely painful situations? - Schoen, Alexis, Burgoyne, Megan, & Sharon Schoen; Are the developmental needs of children in America adequately addressed during the grief process? ; Journal of Instructional Psychology; Jun 2004; Vol. 31; Issue 2. The preceding section contained information about developmental needs of children during the grief process. Write three case study examples regarding how you might use the content of this section in your practice. At approximately 7 to 11 years of age, what will cause a grieving child to need continual validation of his or her own thoughts? Record the letter of the correct answer in the CEU Answer Booklet.